What are the solutions to illegal immigration in America? Can alternative energy effectively replace fossil fuels? Should more gun control laws be enacted? Every year I hold these debates, the classes inevitably choose the same topic: the gun control issue. It makes sense. Scarcely a week goes by that we don’t hear about another school shooting. And most recently at my school, the staff and students underwent ALICE training. A sobering experience to say the least. Given that we live in a rural state, and in a very rural part of the state, many of my students already have strong opinions on gun access. Many don’t believe we need further gun control laws. As part of the introduction to this topic, I started by having them journal write what they already know about the topic, and we shared those aloud. I only had a few students who really didn’t know about gun laws at all, or who didn’t seem to have an opinion either way. Next, I randomly assigned the students to a pro/con team. Some of them weren’t too happy with their team placement because it doesn’t coincide with their views. I had to quell their dissent right away. I told them my intent was not to simply place them on a team with which they already agree, but to teach them how to conduct research and how to argue a viewpoint. I also told them that even though I have strongly held views on the topic, I try to learn something new every year about this issue. I’ve had the good fortune of reading, “Tips for Structured Debate in the Classroom” by Leah Cleary. And her concerns struck a chord with me. I too am concerned about students using logical fallacies in their debate, and the whole thing just disintegrating into surface-level bickering. I like the structured schedule that she has developed, because every year I always get the feeling the debates drag on much too long. Another idea I will borrow from her is randomly assigning debate roles. 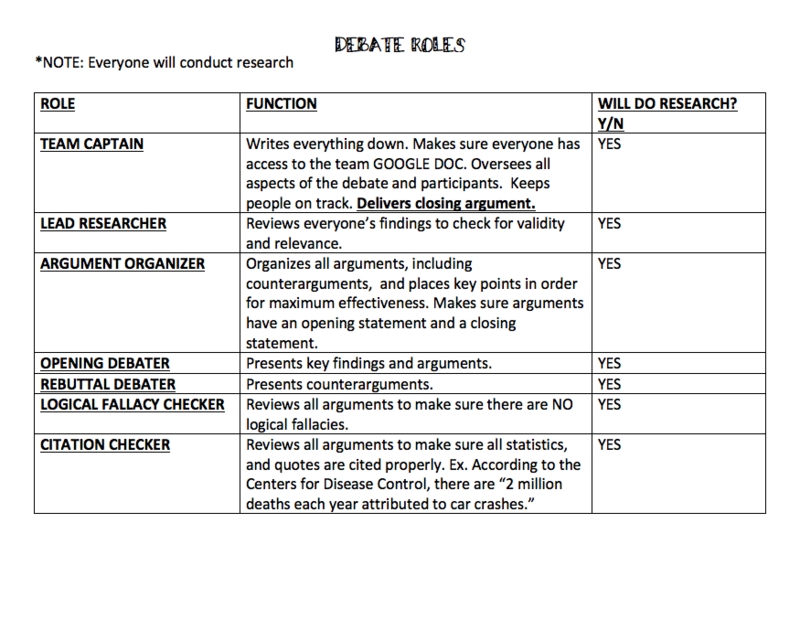 I’ve always had a team captain, but this year I’m adding these roles: lead researcher, argument organizer, opening debater, rebuttal debater, logical fallacy checker, and citation checker. The team captain is a speaking role as well. He/she will deliver the closing arguments. Other speaking roles are: opening debater, and rebuttal debater. It’s important to note ALL students will be researching information. I’ve just informed one of my senior classes of the different debate roles, and one student had a bit of criticism. He said he didn’t like that not everyone gets a chance to speak. I appreciated his honesty. I think explained to him the pros and cons ( I love puns!) of limiting the speakings. I reassured him that there will be opportunities for him to shine in other ways. I also told the class that with any new procedure, I will reflect on the process and make adjustments as needed. Currently, my students are busy conducting research. I’ve reviewed with them how to use the Marvel database to find credible articles and news reports. My fear is that they won’t be able to overcome confirmation bias, but we shall see. I’ve told them to be sure that the full article, that the author’s purpose matches with their debate topic/side. They will read and annotate the article. Next, they will complete a type of sketch notes. I got the idea from Angela Stockman’s work, “Maker Moves in the Writing Workshop.” The original link seems to be missing, but I was able to find the “game” through Stockman’s Twitter post. The idea is to have students complete a “Note-Sketch-Paraphrase” 4×5 card for each of their sources of information. Aren’t these cool? I think it’s a great way to introduce the idea of sketch notes, and I’m all for anything that will help my students remember what they’ve read. I’m also going to show my students the awesome website, pro/con.org. If you’ve never visited Pro/Con I high suggest it. It’s jam-packed with information that is credible and trustworthy. There are videos, articles, talking points, and much more. I like this site because there are so many pro/con arguments all in one location. The topics presented are current and relevant. So my plan is to have each student complete at least 4 sketch-note-paraphrase cards for the debate. I’m also thinking I will ask the students to write one of their main arguments on a Post-It note, and then everyone will do a gallery walk of sorts to gather information from the opposing team. I may ask guest judges help me figure out the debate winners, I’m not sure yet. It’ll depend on which teachers have planning time during the debate time. Next I’m having a sale!! I love your debate topics and also the idea of sketch notes! Fantastic! Thank you!! I appreciate the positive feedback!